"Dyu Sauve not' Gracieuse Royne"
Defense is the Responsibility of the U.K.
933 Part of the Duchy of Normandy. within Duchy of Normandy (nominally after 1204). 1204 - Sep 1205 French occupation. Dec 1205 - Apr 1206 French occupation. Sark, Herm, Jethou and Brechou). 1295 Devastating French raid on Guernsey. of the King of France, by Treaty of Calais. Jun 1372 - 1373 French occupation under Owen of Wales. 19 May 1649 - 8 May 1660 Guernsey part of the Commonwealth of England. 12 May 1945 - 25 Aug 1945 British military administration. 1661 - 1664 Nathaniel Darrell, Jr.
933 Part of the Duchy of Normandy (ile de Aurigny). 1057 Possession granted to the bishops of Coutances. c.1236 Divided between the bishops and the kings of England. their rights by the English king. of the island until 1480. 1558 (two weeks) Occupied by French under Captain Malesarde. 30 Sep 1585 - 1607 Leased to the Earls of Essex. 1607 - 1643 Leased to Chamberlain family. 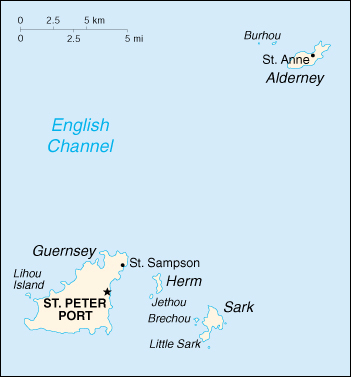 1660 - 1825 Alderney separated from Guernsey. 1660 - 1682 Granted to George Carteret. 13 Apr 1825 Subordinated to Guernsey. 23 Jun 1940 - 15 Dec 1945 Most of the population is evacuated. 2 Jul 1940 - 16 May 1945 German occupation. 1 Jan 1949 New constitution granted. Jun 1204 English possession, part of Guernsey. 1212 - 1214 French occupation. 1343 - 1347 French occupation. 31 Jul 1549 - 7 Sep 1553 French occupation under François Breuil. 1560 - 1562 French occupation by the Seigneur de Glatigny. 23 Mar 1643 - 25 Aug 1660 Confiscated by the Parliament of England. 1922 First elections to Chief Pleas takes place. 4 Jul 1940 - 10 May 1945 German occupation. 9 Apr 2008 Constitutional law granted. to Sibyl Beaumont (s.a.), in fact they sat as a pair in Chief Pleas but she accompanied him to "give advice". Sybil's strong personality, however, ensured that she had the final say in the matters of government. 1556 Granted by the crown to the Seigneur of Sark. Le Marhcant, against the Seigneur of Sark are abandoned. 20 Jul 1940 - 9 May 1945 German occupation. 1836 - 1842 the British Commercial Assurance Co.
which connected the Jethou with Herm. 1028 Given to Restauld (Restald) by Duke Robert of Normandy. 1055 Bequeathed to the Monastery of Mont St. Michel by Restauld. Chesney, then reverts to Monastery of Mont St. Michel. a warren in the island, then it reverts Mont St. Michel. 1416 Part of King Henry V's estates and remains a Crown lease. Note: Lihou is a small tidal island connected to Guernsey at low tide by a causeway. Saint-Michel Abbey to 1415, then under Eton College). 2006 Lihou Charitable Trust formed to administer the house and grounds. descendants (accepted 2 Jun 1927)(Domaine de Hauteville House). Maison de Victor Hugo museum in Paris.